Crews battling a deadly wildfire in California faced a resurgence of gusty winds on Aug. 2, hampering progress they were making this week to keep the blaze from spreading. After three days of light winds that had helped firefighters make significant headway, a “red flag” warning for heightened fire danger was set to go into effect from Aug. 2 through Aug. 4, with increasing winds in the forecast. 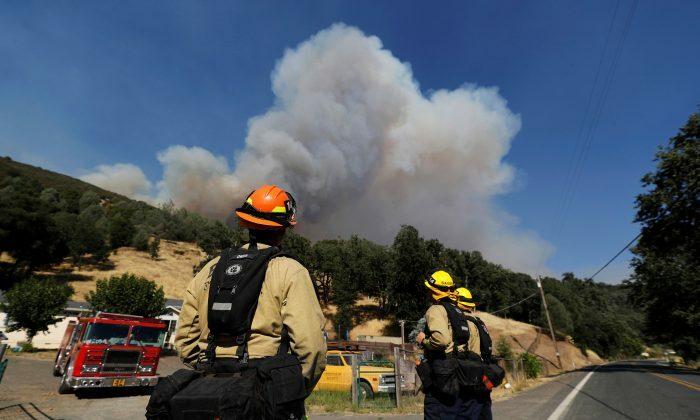 Strong gusts began kicking up again on Aug. 1 across upper ridge lines of the fire’s mountainous western flank, where the blaze, sparked by a vehicle malfunction on July 23, was burning largely unchecked. With high winds expected to worsen, throwing hot embers over containment lines, “we could continue to see those conditions pose difficulty for us into the night-time hours,” he told Reuters by telephone. The 11-day-old Carr Fire, which has scorched nearly 126,000 acres in the scenic Shasta-Trinity region north of Sacramento, remains the largest and most fearsome of 18 significant wildfires burning across California and more than 100 nationwide. The blaze, stoked by drought-parched vegetation and triple-digit temperatures, has killed six people and reduced 1,555 structures to smoldering ruins, including 10,600 homes. It ranks as the sixth most destructive California wildfire on record. Over 4,200 personnel assigned to the blaze have carved containment lines around 35 percent of the perimeter of the blaze. Lauderdale said 24,285 residents remained displaced as of the morning on Aug. 2—down from a peak of 38,000—but the number was dwindling as more residents were allowed to return. More than 100 large wildfires were burning across 13 Western states, having consumed more than 1.4 million, according to the National Interagency Fire Center.